The UK government wanted to set up an internal warning system to monitor and react to decisions made by President Donald Trump, emails show. 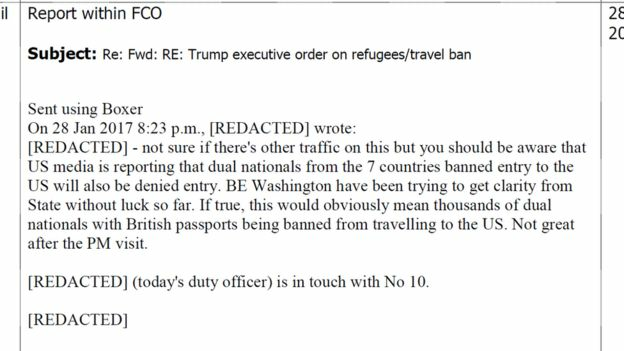 The emails reveal concerns about the impact of Mr Trump’s travel ban on UK citizens and national security. Officials did not want to be caught out by similar orders issued by the US president “just as London is going to sleep”, one official said. The emails were released to the BBC under the Freedom of Information Act. “But we have to remember that this concern was also shared by other parts of the US administration that were at times equally blindsided by the president’s early morning tweets,” added our correspondent. 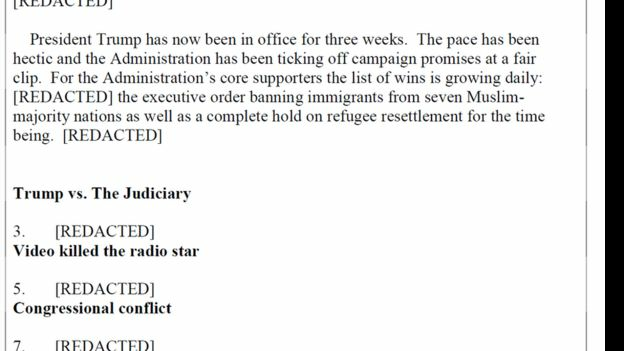 Most of the emails released to the BBC were between the British Embassy in Washington and the Foreign Office around the time of Mr Trump’s executive order halting all refugee admissions and temporarily barring people from seven Muslim-majority countries. 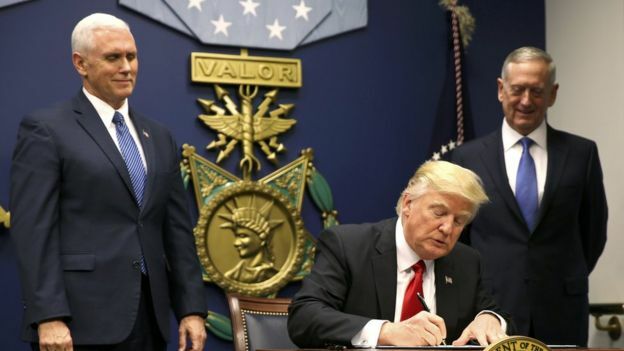 The order, signed on 27 January, was one of string of decrees, proclamations and orders issued by Mr Trump during his first weeks in the White House. 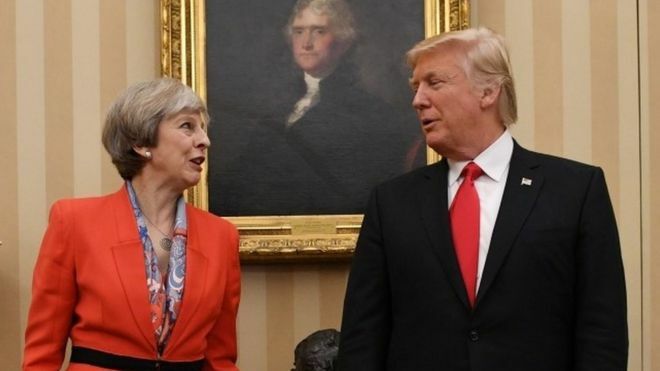 It was signed hours after Prime Minister Theresa May became the first foreign leader to meet Mr Trump at the White House. Foreign Office officials feared the ban would prevent thousands of UK citizens with dual nationality travelling to the United States and discussed the likely impact of that on relations between Mrs May and the new president. “BE (British Embassy) Washington have been trying to get clarity from State (The State Department) without luck so far,” officials said in an internal Foreign Office email dated 28 January – the day after Mr Trump signed the order. In the end, the new restrictions did not apply to British citizens with dual citizenship, but officials were keen not to be caught out again by the actions of President Trump. 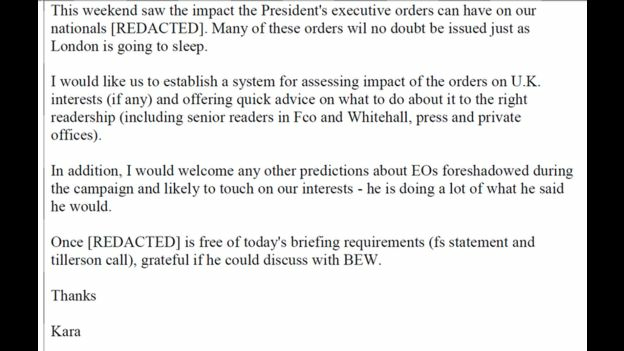 On 30 January, Kara Owen, director of the Americas desk at the Foreign Office sent an email around the Foreign Office, including to the deputy British ambassador to the US Patrick Davies, asking for a new warning system to be set up to look at the impact of Mr Trump’s executive orders on British interests. “Many of these orders will no doubt be issued just as London is going to sleep,” she said. 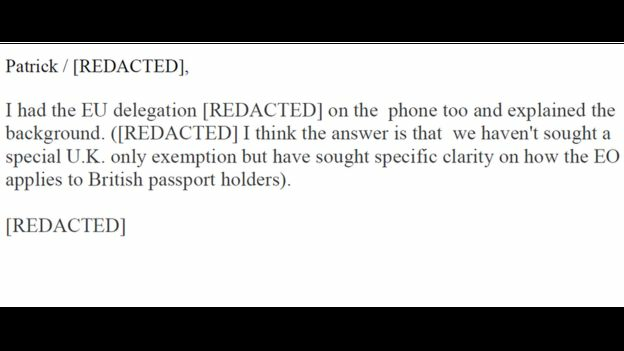 The documents also reveal the EU contacted the Foreign Office to check whether Britain was attempting to get a special deal for its citizens in the aftermath of Mr Trump’s travel ban – and concerns about the impact on national security. In one exchange, the Home Office’s international director, Richard Clarke, discusses “potential UK activism/adverse reaction” in response to the travel ban, with officials at the Office for Security and Counter-Terrorism. Also released was a heavily redacted analysis of the first three weeks of the Trump presidency, including a section entitled “Video killed the radio star”. The documents reveal civil servants expected a change in Theresa May’s friendly outlook towards the US President should British citizens be banned from entering the United States. “You might have seen that the PM didn’t engage on the question on Trump’s immigration policy saying they were for the US,” said one official, referring to Mrs May’s press conference in Turkey on 28 January, when she was questioned about the policy. “Presumably that changes if Brits (ie dual nationals) are blocked from entering the US?,” replied another official. The document warned that questions on whether the government explicitly supported US immigration policy were a “bear trap”. The emails also show Foreign Office also struggled with the weight of communications from MPs in the aftermath of the US President’s executive order. One official complained of “yet another UQ (Urgent Question to be answered in Parliament)”, in reference to a question put by former SNP MP Stuart Donaldson requesting a statement on the impact on the ban on British citizens. Tweets from The Guardian’s Anushka Asthana and Alan Travis, Steve Hawkes of The Sun and Jack Blanchard, then of The Mirror, were circulated with Foreign Office updates.